I’m testing a new mascara and I have thoughts! The packaging is nice. The body of the tube is a lovely rose gold and the cap is more of a true gold. I wasn’t able to get a photo that did it justice yesterday so definitely check out the link to the YSL site up there to check it out. But now on to the important part – how does it wear? Well… naturally, I guess would be the most accurate way I could put it. I did not find that it provided length or volume on my lashes. 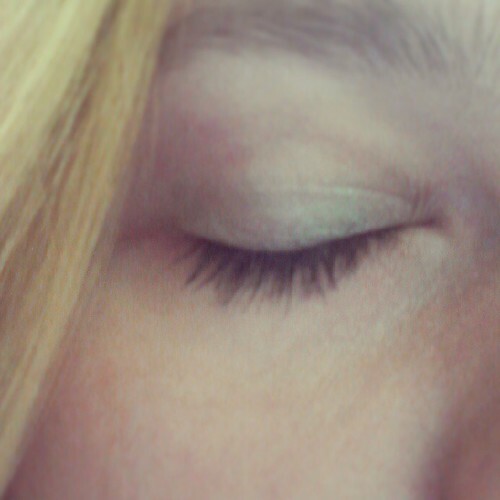 It darkened them nicely, which my lashes need. They’re very light at the tips and that makes them look a lot shorter than they are when I don’t have anything on them. So this provided the definition that my lashes naturally lack, but did it in a way that looks natural. You can’t really tell that I have anything on as well. This is also true of how it feels. It’s lightweight. I can’t feel that I have anything on my lashes. They don’t catch on each other or stick together. They’re not stiff and crunchy at all. There was no clumping and once I made sure to remove the excess from the wand, there were no gloops either. I wore it all day yesterday. Right after I applied it, there were a few specks on my cheeks and I worried that there would be flaking throughout the day, but that did not end up being the case are all. Once I brushed away those initial flakes, it was fine from then on. It looked exactly the same at the end of the night as it did when I first applied it. If I were going for a very light or no-makeup look, this would be the first thing I would reach for. But with a look that required my lashes to stand out a bit more, this one would not be up to the task. After having some more time with this mascara, I’ve come to like it more and more. I discovered that I can get away with wiping less of it off of the brush and thus applying more without it looking clumpy and goopy. This is good and definitely made it more visible, while still remaining flexible and not crunchy. I will definitely consider purchasing this if I’m ever in a position to purchase a mascara again. I keep getting so many samples though that I don’t know when that might be. This entry was posted in make-up and tagged cosmetics, influenster, mascara, review, Volume Effet Faux Cils Mascara, YSL, Yves Saint Laurent.